The Department of Tourism of Santiago del Teide, together with the Cabildo Insular de Tenerife and the Department of Culture organized a series of events over the weekend to celebrate Dia del Tourista – Tourists Day, which were enjoyed by both tourists and residents. 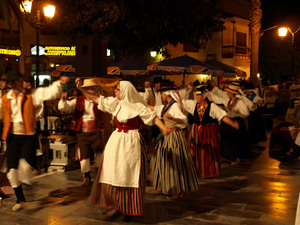 The activities began with a show of Canarian products. 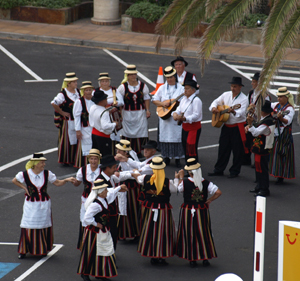 Then later in the day Canarian folklore groups “Tayme” and “Breezes of Arguayo” entertained guests of hotels and apartments as they toured the streets from Playa Arena to Los Gigantes. 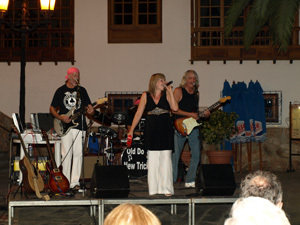 The main event was held last Saturday evening in the Plaza, Los Gigantes. The night started with a show of local products, and then the audience was entertained with performances from several Canarian folklore groups. The evening ended with many lively songs from “Dogs Old New Tricks” who very quickly had the majority of the audience on their feet dancing.